CLIVE, Iowa — A Butler County man has won a lottery prize of more than $91,000. Gregory Dietz of Clarksville won a JACKPOT PARTY® Progressive InstaPlay jackpot prize. 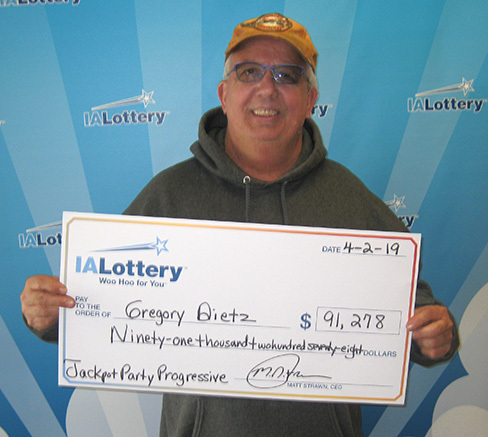 He purchased his winning ticket at Casey’s, 213 S. Main St. in Clarksville, and claimed his prize of $91,278 on Tuesday at the lottery’s regional office in Mason City. The JACKPOT PARTY Progressive jackpot starts at $10,000 and increases with each ticket sold statewide until it is won. InstaPlay combines features from instant-scratch and lotto games and gives players a new option with no numbers to pick, playslips to fill out or wait for a drawing. InstaPlay tickets are "scratchless” because they have no security coating that needs to be removed to determine the prize won. And rather than having supplies of tickets printed in advance like those in traditional scratch and pull-tab games, InstaPlay tickets are printed on demand from the lottery terminal. InstaPlay games range in price from $1 to $5. More details about how to play these games and the number of prizes still up for grabs in them can be found on the Iowa Lottery's website, www.ialottery.com.